I’ve shared a review of this new literature program, but I wanted to give you an inside look into what a week of using this program looks like in our homeschool. If you’ve ever wanted a simple and effective way to add literature studies to your curriculum, this is the perfect program for you. It is planned out well and is easy to use. It doesn’t require any prep time. It’s very engaging because the lessons are built around excellent literature choices and the student workbook is fun and colorful. We have really enjoyed using this program in our homeschool this year, and I was so thankful that Hewitt Homeschooling sent me a copy of the program for a review. Want to know how this program fits into our schedule, how much time it takes, and what a lesson looks like? I used this program with my 4th grade son and my 3rd grade daughter. Since my son is not yet a strong reader (and my daughter is a very fluent reader), I thought it would be best to combine them in this level. Plus, combining kids in one subject means less work for me! My kids particularly enjoyed the weeks when we studied Charlie and the Chocolate Factory so I’m going to give you an inside peek into the first week of that book. Here’s what Week 5 of Lightning Literature looks like at our house. We read chapters 1-7, learned about common and proper nouns, concrete and abstract nouns, a subjects and predicates. We also began an essay on what my kids want to be when they grow up. My kids read chapter 1 of Charlie and the Chocolate Factory on their own and then we gather together and have a short discussion about the reading. We compare and contrast some themes and characters in this new book with the previous book (Rickshaw Girl). Then we study common and proper nouns in the workbook. There is a short explanation as well as two short assignments to practice identifying common and proper nouns. We prepare for our new essay “What I Want to Be When I Grow Up” by brainstorming topic ideas. The book lists several starter questions to help kids think through the process, such as “What education and training will I need?” and “What parts of this job do I think will be the most challenging?” I help my kids by writing down all their thoughts as we talk through the questions and brainstorm topics. We come together to discuss chapters 2 and 3. We spend quite a bit of time talking about story-telling and embellishing stories (like what Charlie’s grandparents sometimes do in the book). Our grammar topic is concrete vs. abstract nouns. There’s a short worksheet page with an introduction to the two different types of nouns with examples. Then we go through the four sentences, underlining all the nouns and marking which ones are abstract. For the composition section, we make a brief outline of the stories the kids plan to write. We order the events and questions that they will answer in their composition. It’s time for discussion on chapters 4 and 5 which entails an interesting talk about corporate espionage and Willy Wonka’s paranoia. Ok, so that was interesting! The kids each choose 5 words to put on their dictionary pages and I help them look them up to understand the definitions. Then we do the worksheet for day 3 which is to match each character with what each might have said. Rough draft time! I scribe for my kids as they dictate a rough draft of their paper to me. I help them make sure they include events in a logical order (using our outline for reference). Today we discuss several of the characters from chapters 6 and 7 as well as their character qualities. We compare and contrast Charlie’s qualities of kindness and generosity. The grammar topic is simple subjects and predicates. We review the examples on the worksheet and then practiced dividing sentences between the subject and the predicate. We finished our paper today by writing a final draft. I went through my kids’ compositions and we discussed possible improvements. Then I had them copy the paper (with the corrections) to save as our final copy. The activity idea for this day was to make some chocolate together. Since I’m kind of lazy and I detest projects, I declared that we would have a chocolate taste-testing party. We had some various dairy free chocolates and my oldest baked us some chocolate cookies. It was a perfect way to end our first week of studying Charlie and the Chocolate Factory! Day 5 is an extra day in this program as it is scheduled on a 4 day week. This gives us an extra day to do fun activities related to the book or catch up on the compositions that we’re working on. I modify the program slightly and have my kids read the chapters on their own before we have our discussions. I like seeing how well they comprehend the book when they are reading on their own. After several weeks, I could tell they were making huge improvements in their independent reading and comprehension skills and we had some good discussions. I really appreciate how the compositions are broken into small bite-size assignments. My kids do not get overwhelmed when writing the essays and stories and because we work through them one step at a time, they have written some impressively good little stories! So far, we all really love our “Lightning Literature time” that we have together. We enjoy our little group discussion. Then we complete the worksheet pages for grammar review and finally we work on the compositions. Overall, our time takes about 20 minutes (not including the independent reading that my kids do to prepare for our time). 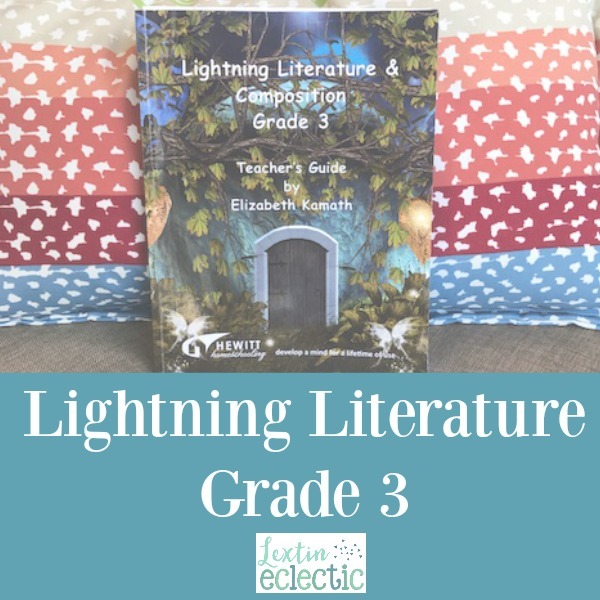 Lightning Literature has been a wonderful addition to our homeschool day this year. It has helped us create a mini book club with my 3rd and 4th grader – and they get composition practice and grammar review too!